The New Zealand Government is proposing a total ban on the finning of dead sharks in response to widespread public concern about the gruesome practice. Finning of live sharks was outlawed in New Zealand in 2009, but it was still legal to remove the fins from dead sharks and throw away the carcass - though the entire weight of the shark was still included in a fishing boat's quota. The new regime requires fishing companies to release sharks alive or bring them ashore with fins attached for processing. New Zealand is among the world's top 20 exports of shark fins, most of which are sent to Asia to be made into a popular delicacy or traditional medicines. 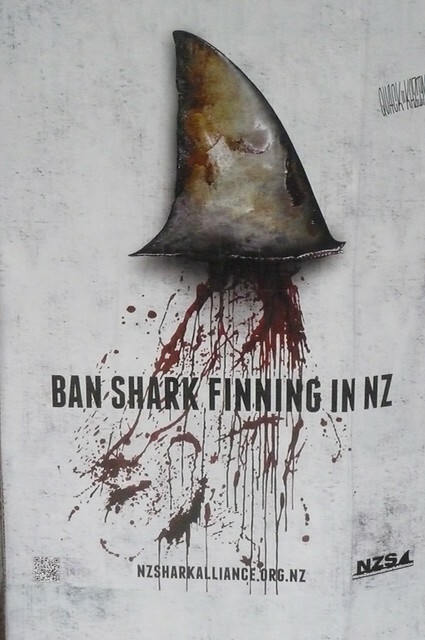 But public discontent about the fishing method has continued to grow, and some businesses such as Air New Zealand have responded by refusing to transport shark fin exports. Between 50,000 and 150,000 blue sharks were believed to be killed in New Zealand waters every year, many of them as by-catch in tuna long-lines. Only a handful of New Zealand restaurants continue to sell shark-fin soup. A decision by the government of New Caledonia to protect its natural wealth and create the world's largest protected area on land or sea is a historic moment in marine conservation and sustainable development. The new law brings under careful management a multi-use, marine protected area which totals a massive 1.3 million km2, making it the largest protected area in the world. Essential to people, biodiversity and climate resilience, the park's ecosystems generate around 2,500-3,000 tons of fish each year, providing food to New Caledonia's quarter of a million people and an economic driver for the territory's sustainable economy. Located 2,000 miles east of Australia in the Pacific Ocean, the Natural Park of the Coral Sea covers all of New Caledonia's Exclusive Economic Zone (EEZ), or, the marine waters extending 12 to 200 nautical miles from its coasts. 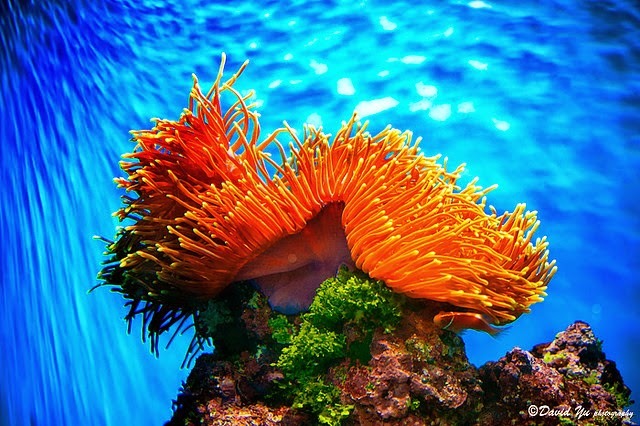 According to the International Union for the Conservation of Nature (IUCN), the park is home to more than 4500 km2 of fishery-supporting coral reefs, the deepest site in France (7919m. 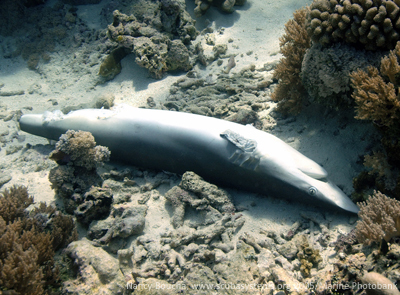 deep), 25 species of marine mammals, 48 shark species, 19 species of nesting birds and five species of marine turtles. 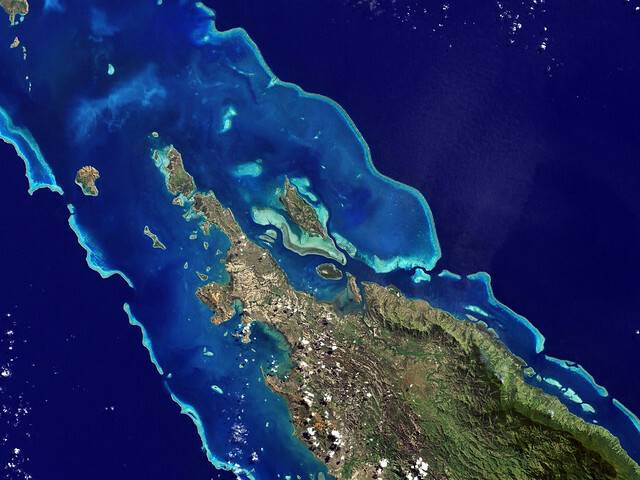 New Caledonia itself is the world's only stand-alone Biodiversity Hotspot, and a French overseas territory, which is highly dependent on its natural capital. Its coastal waters boast the world's largest lagoon, which has earned UNESCO World Heritage Site status. In the next phase of the park's development, the levels of protection will be defined. Ultimately, the Natural Park of the Coral Sea will be a multiple use area with various zones for economic activity and conservation. The deep ocean surrounding Europe is one of the most biologically rich and diverse areas of the planet. A new regulation to effectively protect this area from the destructive impact of deep-sea fishing, including through phasing out bottom trawl fishing in the deep-sea, would be one of the EU’s most significant legislative achievements. Numerous scientific reports published by the International Council for the Exploration of the Sea, the European Union’s Hermione Project, the UN Environment Programme and others have highlighted the destructive nature of bottom trawling to slow growing, low-productivity deep-sea fish species and deep-sea ecosystems such as cold-water coral reefs, sponge fields, and other deep-sea habitats found along the continental slope and on seamounts in the Northeast Atlantic. The Deep Sea Conservation Coalition has called on the UK government to lead the effort at European Council to phase-out deep-sea bottom trawling in the Northeast Atlantic to protect the biologically rich areas of the deep-sea in European waters. The total amount of trash picked up during the 28th year of Ocean Conservancy's International Coastal Cleanup weighed more than 12 million pounds, the most ever collected in the event's history. This new total is an indicator of the tremendous amount of ocean trash found on shorelines and in the ocean and waterways around the globe. "Ocean trash truly is a global problem that affects human health and safety, endangers marine wildlife, and costs states and nations countless millions in wasted resources and lost revenue," said Andreas Merkl, Ocean Conservancy's president and CEO. At its core, however, ocean trash is not an ocean problem; it is a people problem – perpetuated by the often unwitting practices that industry and people have adopted over time. Additional information about items found, infographics, and state-specific data are available online at www.oceanconservancy.org. China is changing, and the new interpretation of China’s criminal law is a political step that reflects changing attitudes to the treatment of animals. To China’s increasingly vocal animal activists and members of its “one-child” generation, the exploitation of wildlife for human benefits is not only selfish and short-sighted, but also self-destructive. Since the adoption of President Xi Jinping’s austerity policy, shark fin consumption in the last Chinese New Year has dropped significantly. A wider animal protection movement is also gathering momentum and is challenging patterns of eating that are promoted by business interests. Now you can get 10 years in the slammer for buying or selling 420 different endangered land and aquatic species for food. So order carefully ... because pangolins, golden monkeys, moon bears, tigers, rhinos, lots of turtles, and some species of sharks are all technically off limits. Development in China is increasingly seen not just in economic terms, but in an appreciation for quality of life and a desire for the government to take a moral lead. Wildlife protection is a crucial component of this. As a rising superpower, the Chinese government’s actions for wildlife protection will not only enhance its legitimacy domestically, but internationally too. Researchers surveying the ocean floor for the oil and gas industry discovered something much more unusual and rare: a sea creature graveyard. 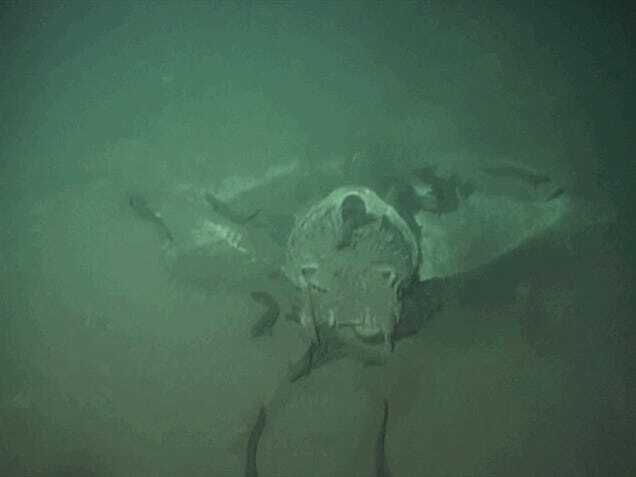 Remotely operated vehicles scanning the seabed off the coast of Angola captured rare footage of several large deceased animals that have become home to a new ecosystem for scavengers and other marine creatures. It's an unusual find because little is known about the fate of vertebrates below 600 feet. Dr. Nick Higgs, from the University of Plymouth's Marine Institute, explained that "There's been lots of research on whale-falls, but we've never really found any of these other large marine animals on the sea bed." 2. Plenty More Fish in the Sea - Maybe not! 3. Groupon Caught Selling "Pills of Extinction"
When people think of sustainability, generally bluefin tuna or sharks come to mind, but seaweed is an important part of the ocean as well and needs to be considered in sustainability programs. Seaweeds are a harvestable marine resource, but they also serve as habitat for other sea life and are an important component of the marine ecosystem that deserve more attention and protection. The Marine Stewardship Council has presented a new global certification program that aims to protect wild seaweeds from overfishing. These seaweeds serve not only as a crop but a habitat for hundreds of other ocean species. This program would be the first to set a global standard for seaweed fisheries and farms that enforces sustainability. Researchers from AZTI-Tecnalia, a Spanish-based technology center specializing in marine and food research, report in the journal "Global Change Biology" that marine life could be dramatically affected as climate change threatens to increase. Researchers theorize that global warming may be responsible for the severe reduction of plankton, a key source of nutrients to several species in the ocean. Phytoplankton are the single-celled plants that are the basic building blocks of most marine life. In particular, they sustain zooplankton, tiny krill-like animals that are eaten in turn by fish. Sea surface temperature is predicted to increase by 2º C on average globally by 2080 - 2100. The consequences of this increase will include changes in ocean circulation and higher water column stratification, where water of different densities creates distinct layers instead of mixing - affecting the availability of nutrients. In 2011, the global discount shopping organization known as Groupon made an agreement with Sea Shepherd Conservation Society to stop selling shark products —specifically shark cartilage pills. But earlier this week, Groupon betrayed this promise and posted a promotion for "Blue Shark Cartileae" pills. The health supplement industry is quietly slaughtering massive numbers of sharks and riding the coattails of destruction caused by the shark finning industry and just "picking up the scraps," as they’d have you believe. Practitioners of traditional medicine still believe that shark cartilage has magical healing powers, and because of this, entire populations of blue sharks are being decimated. Sign this Petition urging Groupon to remove the products immediately. Sean Lesniak, a 9-year-old boy from Lowell, Massachusetts, spoke to lawmakers about his legislation to protect endangered species. He handed out shark plushies trying to convince legislators to back a bill that would ban the practice of buying or selling shark fins in Massachusetts. "These are animals that help support our coral reefs," he said. "We need them to keep the fish population in order and our seal population in order and all that." The European Commission has announced its proposal to ban all types of driftnets from operating in European waters. The measure is aimed at eliminating alleged loopholes that allow illegal fishing with driftnets to continue. 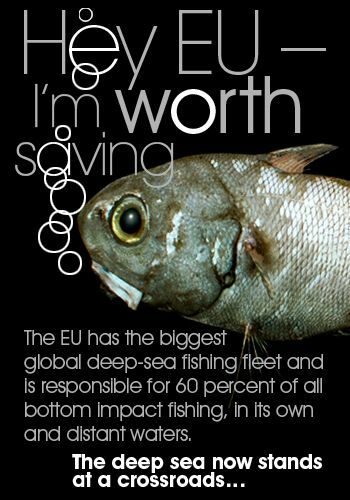 Oceana is concerned that the measures proposed by the European Commission could penalize thousands of sustainable artisanal fishing boats and open once again the potential for massive subsidies fraud rather than targeting the few vessels that have continued illegal, unregulated and unreported (IUU) fishing activities and that should have been officially blacklisted years ago. 4. Around the World in a Canoe! Fishermen off the coast of Japan hauled in an extremely rare megamouth shark recently, making it one of the only 58 specimens ever caught or seen by man. Megamouth sharks are docile filter-feeders with wide, blubbery mouths and are related to whale and basking sharks. Considered one of the rarest fish in the world, megamouth have been been sighted in California, Japan, Taiwan, Indonesia, Brazil, Ecuador, Senegal, South Africa, Mexico and Australia. The last seen megamouth shark was accidently caught in the Philipines in 2009. 1. Make better seafood choices. 2. Discard trash with care. 3. Be a responsible beach-goer this summer. 4. Be considerate of sea life habitats. Catch the full article at the Sea Save Blog by clicking here. Shrimp fisherman Carl Moore, 63, accidentally caught a rare goblin shark last month off the coast of Key West, Florida. Carl didn't realize what he had caught when he saw the pink fish, estimated to be 15 feet long. Goblin sharks are normally found at about 3,000 feet below the surface, and scientists are baffled as to why this one was found at only 600 feet. Goblin sharks date back to prehistoric times and are often referred to as a "living fossil." The last goblin shark was sighted off the coast of Japan in 2007. Carl Moore released the animal after snapping a few photos of the unusal-looking creature. Using nothing but traditional non-instrumental navigation techniques, members of the Polynesian Voyaging Society are embarking on a multi-year journey around the world on board Hawaii's legendary "Hōkūle‘a canoe." Along the way, they will meet with diverse cultures to inspire them to connect with the natural world, their ancient ways, and with each other, spreading the lessons learned through the revival of this ancient skill that has helped revitalize Hawaiian culture. The core message is "to mālama (care for) Island Earth" – our natural environment, our children, and all humankind. Follow the adventure on this blog through the words and pictures of the crew members themselves on board the canoes and at port around the world. Learn more at hokulea.org. A new study estimates that 20 to 32 percent of wild-caught seafood imported into the U.S. comes from illegal or "pirate" fishing. The estimated illegal catch is valued at up to $2.1 billion annually and represents as much as 26% of the total value of wild-caught seafood imported into the U.S.
Scientists reported that tuna from Thailand had the highest rates of being caught illegally, followed by pollack and salmon from China, then tuna from the Philipines. Canada, Vietnam and Chile have less than 10% illegal catches. Although the illegal fishing trade is hard to control due to the vastness of the ocean, countries are cracking down on pirates. South Korea led by example when they apprehended 10 illegal fishing vessels in 2011. The threats faced by our ocean at times seem overwhelming. Organizations like Sea Save Foundation have made considerable difference in conserving the ocean. But in the face of pollution, overfishing and other daunting problems, it’d make me wonder ‘What role can I – an individual - play in conserving these vast water bodies?’ Just like little drops of water make the mighty ocean, every small act can lead to big wonders. Here are 5 changes you can make to help make a difference in conserving the oceanic ecosystems. You walk into a grocery store; head over to purchase seafood because it’s a healthy option. But is this resource sustainable? According to Seafood Watch, we take over 1/2 billion pounds of seafood out of the ocean each day. Poor fishing practices are harming the sea floor, damaging fragile ecosystems like coral. 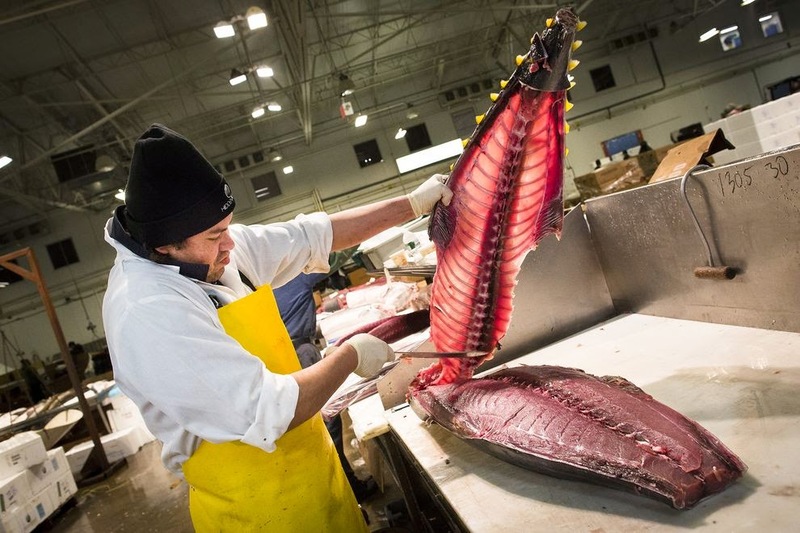 Making better seafood choices, you can help ensure that there are more fish in the sea. This has spurred a trend of aquaculture; similar to raising cows and sheep on land, they raise fish. Nearly half of the fish we consume today comes from one of these fishing farms. Sustainable fish farming respects the surrounding environment, uses water and other resources wisely, and does not interfere with natural, wild fish populations. You can find out whether the fish farm which supplies to your neighborhood grocery store or restaurant is environmentally responsible with the Sea Food Watch App. Trash which is collected from our homes every week doesn’t simply disappear. Study of the Pacific Ocean floor shows accumulation of manmade trash items like rubber tires, glass bottles, leather shoes etc. as deep as 13,000 feet on the seafloor. About a third of it is plastic. In the absence of light, heat, and bacteria, plastic takes many years to degrade, posing a major hazard for marine animals. Sea birds, turtles, seals, and other animals often mistake floating plastic for food or become tangled in it and die. Help prevent this by curbing your family's throwaway habits. Never flush non-degradable products, such as disposable diapers or plastic tampon applications, down the toilet. These products damage the sewage treatment process and end up littering beaches and waters. Do not throw cigarette butts on the ground or out car windows. Such loose trash will trickle into the storm drain which gets carried to the ocean. Helium balloons released outside often end up in the ocean and harm animals that mistake them for food. Ultimately, all the waste we throw into the water comes back to bite us. Hormones, antidepressants, painkillers, and other drugs show up in our water supply and harm aquatic life. People have reported getting sick from swimming and eating fish from polluted bodies of water. Contact your local government body to learn the proper methods of disposal for unused or expired medications, batteries, paint, appliances and other products. We humans love the beach and a trip to the beach or out on the water to snorkel or fish can be a great way to celebrate the weekend, or your holiday. But that doesn't mean we're always kind to the beach. Our indifference results in beach erosion and widespread pollution. Explore and appreciate the ocean without interfering with wildlife or removing rocks and coral. 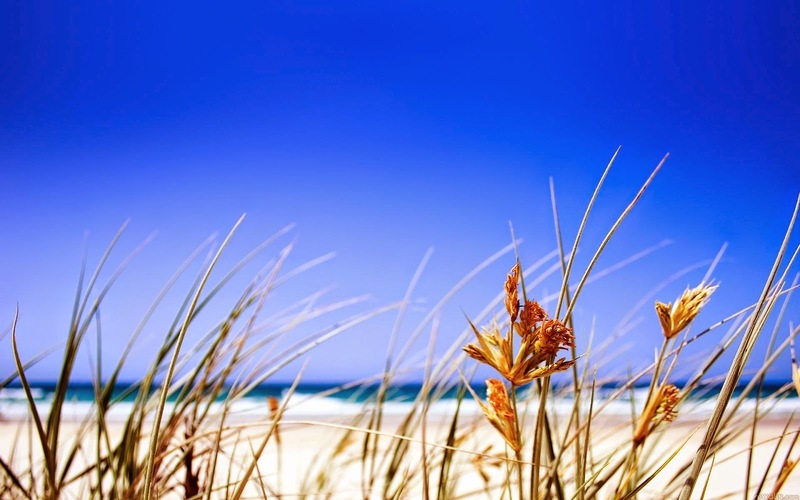 When walking on sand dunes, be careful of any grasses and plants growing there. Living plants help hold sand in place. Dead plants and seaweed provide fertilizer. Both should be left alone. Avoid purchasing items such as coral jewelry, tortoiseshell hair accessories (made from hawksbill turtles), and shark products. Be kind to your beach. Leave it cleaner than you found it. Every terrain is important to marine life. Shallow tide pools on rocky shores can be a great place to look for interesting marine life. But be careful not to trample on these fragile critters and their homes. Don't bother sea birds, mammals, and turtles or their nesting grounds. Look, but don't touch. When snorkeling or diving, never touch the reef. Corals and other animals are fragile and easily killed by a grasping hand or careless flipper. Also never feed or handle marine animals. Never dispose of fishing line or nets in the water. They entangle, injure or kill unsuspecting animals. Take part in a beach cleanup. Report illegal dumping to your local authorities, the Environmental Protection Agency or the local coast guard. Encourage your local government to recycle and upgrade sewage treatment systems. 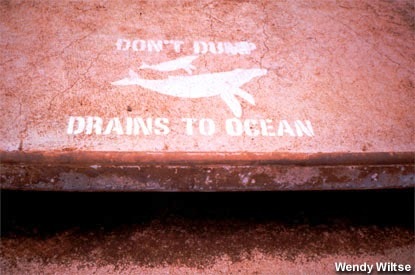 Urge public officials to support measures that help the ocean. State and local governments issue seafood contamination warnings and beach closure warnings. Read labels and signs and ask questions. By learning why a beach was closed or why certain seafood is contaminated, you may also learn how to prevent it from happening again. Learn more about the ocean and conservation by reading, watching films, attending lectures, or visiting aquariums and museums. What you do on your own may seem like a drop in the bucket, but if we work together, we can make a huge difference. So let’s get started! A newly discovered protein in coral reefs may be able to help in the fight against HIV/AIDS and ultimately save millions of lives. Even in small doses, the protein has proven to be extremely potent in blocking the virus from entering T cells, the first step in HIV infection. The protein also has the ability to block the virus without allowing it to become resistant to other HIV remedies, rendering it very useful in combination with other HIV treatments. Scientists involved have stated that they plan to move forward in produce treatment methods using the protein, but without harvesting the ocean’s supply. "You can't strip the Earth of this coral trying to harvest this protein" states Dr. O’ Keefe. Researchers plan to incorporate the protein into sexual lubricants and gels as a preventative measure against the HIV virus. An environmental group has begun a campaign aimed at Manchester restaurants, demanind that they terminate all sales of shark fin soup. The group swarmed to the Arndale Centre to rally support and was very successful in engaging the community. 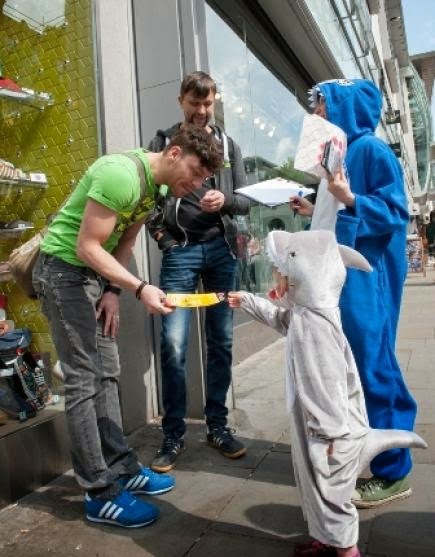 The nationwide environmental campaign Bite-Back aims to make Britain one of the first countries in the world to ban the controversial shark fin soup. Their ‘Hacked Off’ campaign has already motivated 16 restaurants in Britain to drop the dish but there are still a further 60 UK restaurants which still serve the controversial Chinese staple. 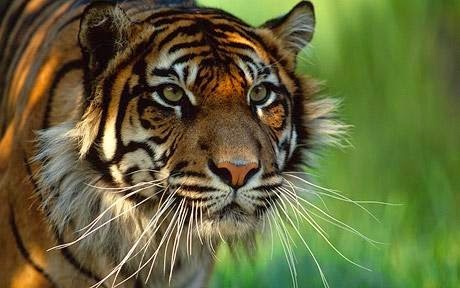 Recent decisions in China have now made it punishable by law to consume or knowingly purchase the biproduct of an endangered animal. The recently passed law protects over 420 different species and carries up to a 10 year prison sentence for violators. With the new law passed, items such as tiger meat, elephant tusks and the coveted shark fin soup, are all included on the list of banned animal biproducts in China.Citizens convicted of eating a protected animal or knowingly purchasing on to do so can face betwen 3-10 years in prison. If China stays true to their word, many critically endangered species, such as the pangolin, siberian tigers and multiple species of sharks, have hope of rebuilding their population. Real the full article at the Sea Save blog by clicking here. 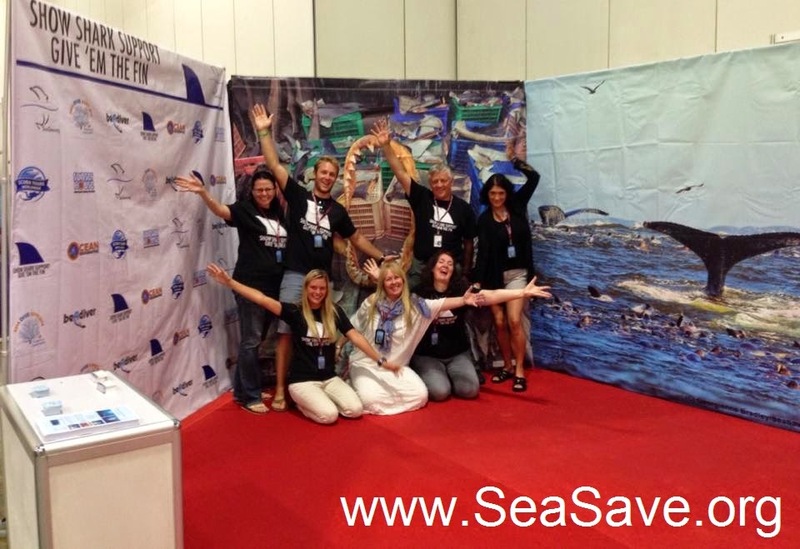 This April, the Sea Save Foundation team attended the 2014 Asian Dive Expo (ADEX), held in Singapore. 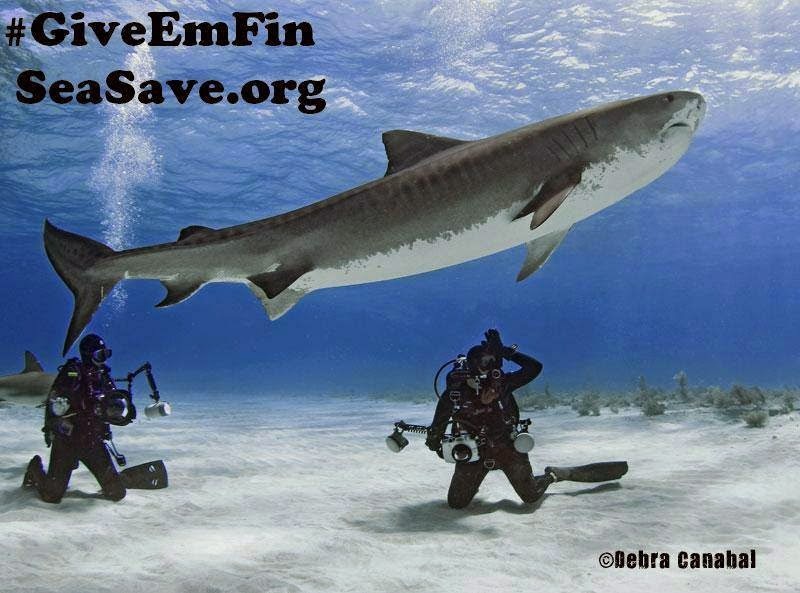 Our group was highly successful in engaging the community and bringing global awareness to the unsustainable shark finning industry through our "Give Em' The Fin" campaign. Our campaign was wildly successful, and over 50 % of the images currently displayed in the mosaic were uploaded at ADEX. Participants were asked to take a picture "Giving The Fin" and to upload that image to the mosaic. People were delighted to partake in the campaign and many had their own fun variations on how they participated. Keep following the efforts of Sea Save Foundation and stay tuned to see how you can help to protect our sharks. We encourage you to also upload photos of you and your friends "Giving The Fin" to our mosaic by clicking here. Join us. It's Your Ocean. Do Something About it! To read the full article, visit the Sea Save blog by clicking here. Marriott International, the prominent worldwide hotel chain, announced this week that they not only will no longer serve shark fin soup but that all shark fin products are officially banned from Marriott properties. Marriott removed shark fin soup from their menus in 2012 and effective July 1st, shark fin will be completely banned. 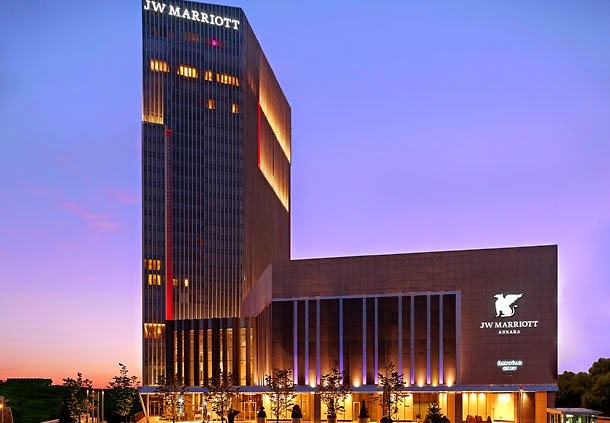 Since the removal in 2012, Marriot has seem a 80% decrease in their use of shark fins, furthering prompting the hotel chain to remove it from their menus. Other well-known hospitality corporations are following suit and tailoring a more environmentally friendly menu. Starwood Hotels and Resorts have publicly announced that they will terminate the sale of shark fin soup by the end of this year. Hilton has stated that over 96% of their properties in the Asian world would stop taking shark fin orders, and had already eliminated the option for shark fin catered banquets in 2013. 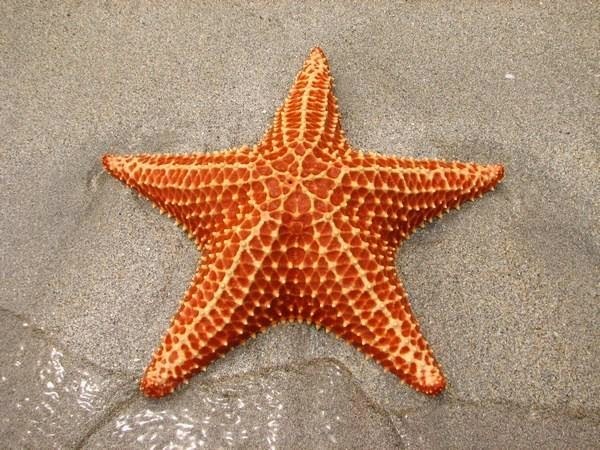 Marine biologists have cautioned that the mass deaths of starfish along the United States west coast in recent months could also occur in the Caribbean region because of climate change, threatening the vital fishing sector. Starfish eat mussels, barnacles, snails, mollusks and other smaller sea life so their health is considered a measure of marine life on the whole in a given area. In turn, they are eaten by shorebirds, gulls, and sometimes sea otters. If it turns out that climate change factors such as ocean warming are indeed implicated in the starfish die-off, there is the possibility that the same thing could happen in the Atlantic and affect Caribbean species.